While LAMP traditionally stands for Linux, Apache, MySQL and PHP, we will be using MariaDB instead of MySQL here as MariaDB is the default in CentOS 7. Don’t worry as it’s a drop in replacement for MySQL so it’s essentially the same from a management perspective. As we already have CentOS 7 installed and ready to go, we will proceed by using yum to install the Apache, MariaDB and PHP packages as shown below. By default both the Apache web server and MariaDB database will not be enabled to start on system boot as confirmed below. We can enable these services so that they start up automatically on system boot as shown below. Although our services are now enabled to start automatically on boot, they are not currently running. We’ll now proceed to start both Apache and MariaDB, confirming that they are actively running afterwards. By default firewalld is running and enabled in CentOS 7, so external HTTP requests to our web server will be blocked automatically. We will therefore modify firewalld so that it accepts inbound traffic on port 80 for HTTP requests. First we add the HTTP service as a permanent rule so that it persists over system reboot, then we reload firewalld so that the change is active in the running configuration. Now if we list the services that are accepted through the firewall, we will see http listed along with ssh and dhcpv6-client which are allowed through by default. 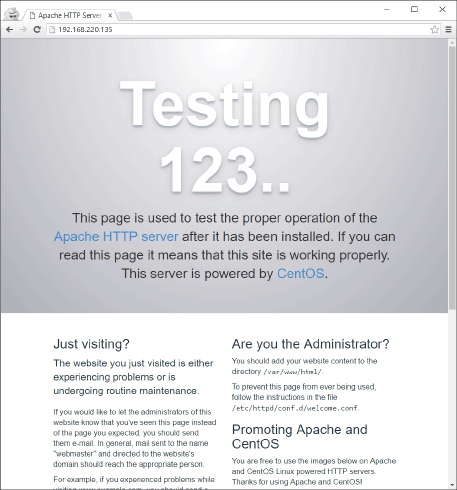 We can test by putting the IP address of the server into a web browser, we should see a default Apache test page if Apache was able to respond to the request correctly. If you’re unsure of what your IP address is, you can run the ‘ip’ command. For testing purposes we will create an index.html page in the /var/www/html directory, this should then be loaded rather than the default Apache page that we saw earlier. Great, so Apache is serving our static content, now let’s check that PHP is working properly and is able to serve out dynamic content. 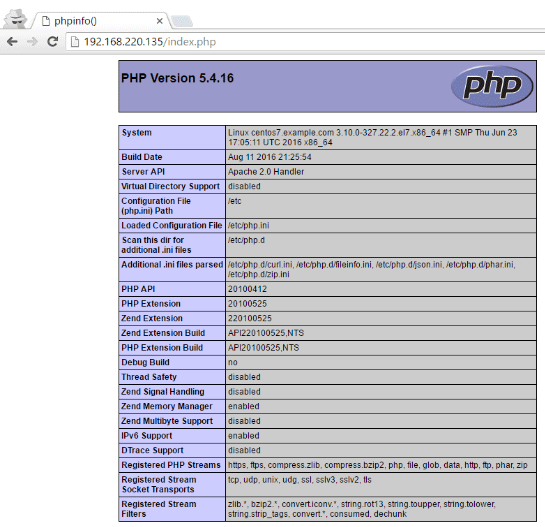 We will do this by creating a phpinfo file, this simply outputs all sorts of information about PHP to the page. 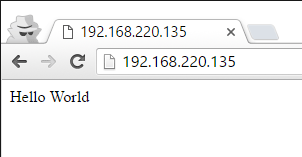 Now if we load the IP address followed by index.php we should see the PHP information page. This confirms that Apache is able to serve dynamic PHP content. Finally we’ll create a simple database with some example content to display on our page. To quickly configure MariaDB, run ‘mysql_secure_installation’ and work through the steps. For my installation I responded with yes to everything, this will set the root password for the database. See our installation guide for further information on setting up MariaDB. Once complete we will log into MariaDB as shown below. This will prompt us for the root password which we have just set. Now that we’re at the MariaDB prompt we can create our database. Once the database has been created we specify that we want to use it. Next we’ll create a table and insert some data into it. Rather than using our root account we’ll create a new ‘demo’ account which only has select permissions on the user table in the testing database and nothing else, as this is all that should be required to read the data. Using the root account for this simple purpose is not considered a good security practice. Now let’s print this information out to a web page with the help of PHP, this is why we installed the php-mysql package at the start, it is used so that we can access MySQL/MariaDB databases through PHP. The example we’re using here is based on this example from w3schools.com. Essentially this PHP script will load the contents of firstname and lastname from the user table in the testing database, printing them out to the page. And with that final example we have now created content that uses a PHP script to read data from a MariaDB database which is then served out over HTTP via Apache. We have shown you how to install Apache, MariaDB and PHP, allowing you to turn your CentOS 7 Linux installation into a fully fledged LAMP stack web server. Awesome tutorial . The best I’ve seem. 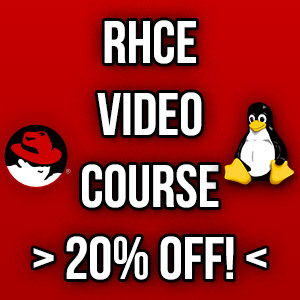 Great tutorial with thorough explanation. Thank you!